Assassin’s Creed Odyssey takes place in ancient Greece during the Peloponnesian War, in which both Sparta and Athens are riven by internal political strife, even as they attempt to destroy one another. But there are moments in the game when the politics feel familiar to us in the modern world. Obviously, such scenes are all interpretative, depending on your perspective. But I don’t believe it’s a coincidence that the game takes on issues that animate us, as much as the ancient Greeks, like freedom of speech, the war against “elites,” collusion with aggressive foreign powers and women’s rights. 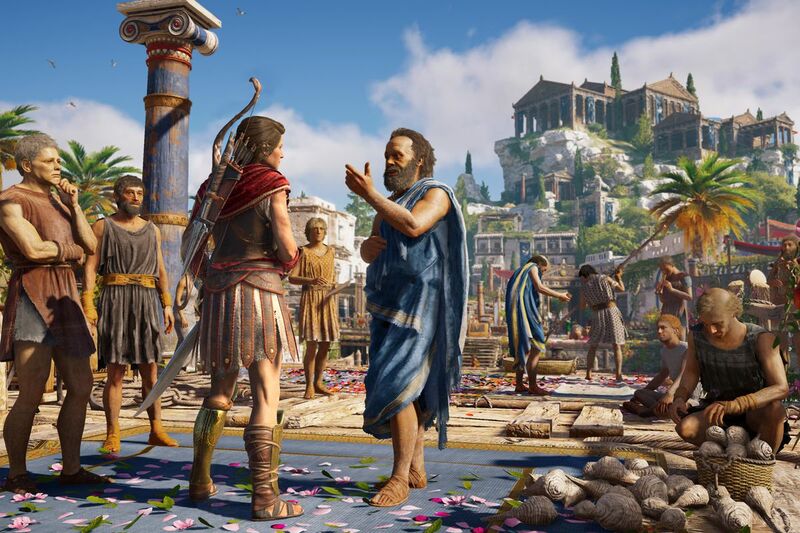 In one quest, Socrates and the game’s hero Kassandra (or Alexios, if you pick the male lead), debate the individual’s right to say anything they please. Socrates interrogates the issue in his usual manner, asking lots of difficult questions. But Kassandra holds her own with the philosopher. In the end, they agree that freedom of speech is an absolute right, but that it also has consequences for the individual. In the game, Socrates and Kassandra agree that a man who makes enemies through his opinions ought to be allowed to say his piece, but that prudence demands that he acknowledge the likelihood that his comments will invite trouble. Socrates was still a middle-aged man at the time of the Peloponnesian War. Later in life, he was tried and executed for disrespecting the gods. He said he would rather die than cease to question the world around him, including the gods. One of the main stories in this game is that of a secret cabal who put their own interests above those of the state. This organization is made up of society’s richest and most influential people, yet they style themselves as enemies of “elites,” a common tactic among modern political parties. They are even willing to allow foreign powers to take over their political affairs, seeing this as advantageous to their private interests, and to their essentially plutocratic class. Odyssey features a woman in its lead character, and plenty of NPCs and warriors are powerful women. The game’s notes point out that men dominated warfare at this time, but that women were also known to fight. However, despite our general view of Ancient Greece as a progressive society, certainly in comparison to many of its contemporaries, Odyssey’s writers also point to codified misogyny. Kassandra’s mentor Markus is a rogue. Although she is fond of him, and feels she owes him for raising her, she is not blind to his habit of exploiting other people. At one point, she finds him in ownership of a vineyard. He boasts that the owner of the vineyard died without sons, and that the dead man’s wife is legally barred from inheriting property. He moves in to take advantage of the woman’s situation. We see the woman reduced to a state of sorry drunkenness, suggestive of depression.